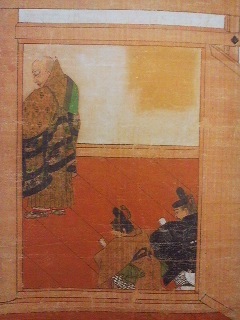 Before the establishment of the first museums in Japan (after the Meiji Restoration of 1868), most objects deemed to possess artistic or some other value, were kept safe in the storehouses of the great aristocratic, warrior or merchant families- when not out on display in their manors, villas, castles, or townhouses. The general public obviously had no access to these works. 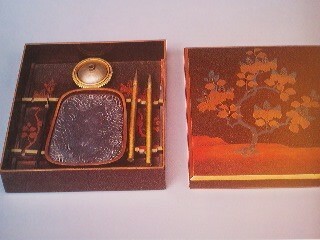 Many Buddhist temples and Shinto shrines also had treasure houses. 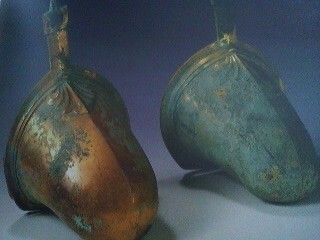 These contained all sorts of objects which for various reasons were considered worthy of preservation. 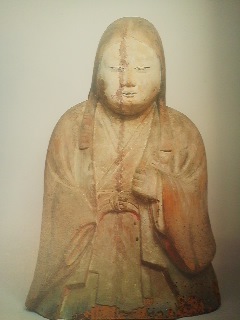 When fanatics loyal to the Meiji Government started destroying Buddhist images (in the 1870`s), many important objects were lost- but it also made such works easily available (at bargain prices) to foreign collectors- thus making Buddhist art- its statues and paintings, etc., relatively familar to Western museum-goers. 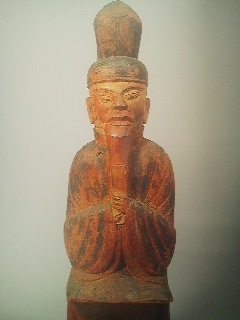 On the other hand, art and other artifacts related to Shinto, the name which is used to refer to Japan`s native religion( as oppossed to Buddhism which was imported from abroad), are much less familiar- even to the Japanese! 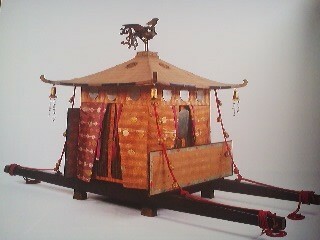 When I mention the current exhibition of Shinto Treasures to my friends, most ask – what in the world are they showing? The reason for this is that when people visit a shinto shrine they almost never enter the shrine buildings. After washing their hands, they approach the front of the prayer hall, throw a coin into an offerings box, clap their hands together, bow and then clap again. Sometimes they might pull on a rope to ring a rattely bell. 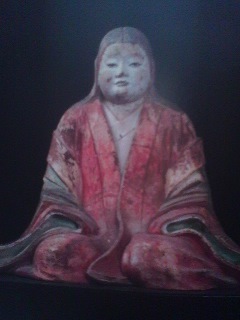 Unlike in Buddhism images are not usually used to instill a sense of calm, fear, or awe in the worshiper. A visit to a shrine IS often beautiful, however,- there is usually an impressive sacred grove surrounding the shrine buildings which are themselves usually very pleasing to the eye- but there are almost never any paintings or statues of a deity which a worshiper might see or one that we would imagine inside a museum. The sense of awe in Shinto usually derives from some natural phenomemenon- the woods, a particular tree, a strangely shaped stone, a waterfall……..
So….. what is on display at the current exhibition? All sorts of things! 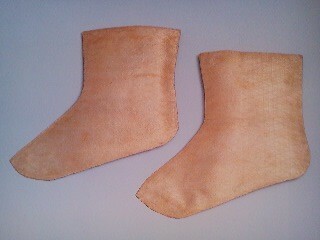 Socks, robes. pantaloons, toiletry kits, armor, swords, archery sets, Noh masks, fans, calligraphy sets, hanging scrolls, manuscripts, saddles, stirrups, hats, beads, and coins……… almost all of them designated National Treasures or Important Cultural Properties! How are most of these items related to Shinto? Well, let me try to explain. Shrines might preserve in their treasure houses (or in the main halls themselves) four main types of objects. The first are SHINPOH (神宝), works of the highest quality and cratsmanship, which were placed in the worship halls of certain prominent shrines. 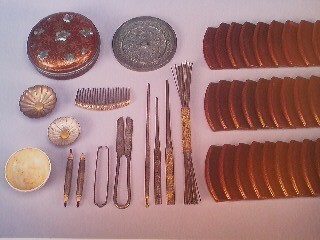 Mirrors, writing sets, trays, toiletry cases, armor, swords, fans, chests, etc, which were all meant to be part of the furnishings of the hall in which a deity was believed to reside- just like an ancient Japanese kofun tomb would contain objects for the deceased to used in the world to come. Objects worthy of his status. Thus, when there was enough money available ( which is why such treasures are found only in certain richly endowed shrines) patrons had the best craftsmen create first-rate pieces- fit for a deity. When time passes and shrines are rebulit ( this often takes lace every 20 years) older objects are placed for safe keeping in a treasure house. And because shrines were often associated with great families, and the divinities worshipped there believed to be the protectors (or actual ancestors) of these families, there are often found in shrine treasure houses the ancient symbols of power and authority in Japan- mirrors (which are decorated on their back sides), swords, and MATATAMA jewels. 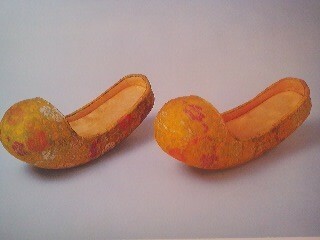 There are plenty of these at the current exhibition- some of the finest examples you will ever see. 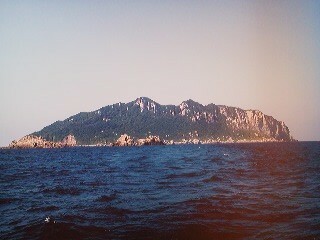 Notable for those interested in Ibaraki Prefecture. On display now in Ueno is what used to be Ibaraki`s ONLY National Treasure, the 270.5 cm long Chokuto long sword, said to have been made in the 5th century. The second type of objects are offerings (SONAEMONO) made to particualr deities to give thanks for blessings bestowed or as acts of supplication for good health, prosperity, victory in battle, plentiful descendants, protection from disease or disaster, etc. At the current exhibition, which brings together a selection the best of the pieces kept at shrine treasure houses across Japan, the most interesting of these offerings (in my opinion) come from the island of Oki no Shima off the coast of Fukuoka Prefecture on the Island of Kyushu. SInce the second half of the fourth century travellers going by ship from Japan to the continent (or the other way around) would stop off at this sacred spot and leave offerings as a prayer for a safe journey. 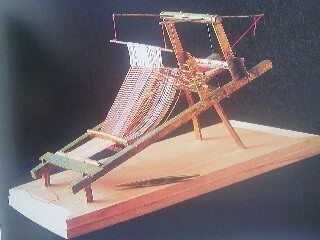 This custom continued for about 600 years and the small island is now an archaeological treasure trove with the unearthed artfacts revealing not only a a lot about ancient Japanese religious practices (and their connection with the continent, but also a surprising variety of impressive crafts- especially the miniature loom, which must have been left by a great textile merchant. There are also distinctive (embryo shaped) magatama beads, equestrian fittings, belt buckles, mirrors, and a gold ring- all from the island and on display now in Ueno. 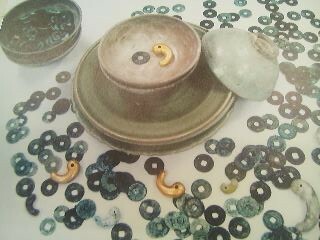 Also very thought provoking, is the display of offerings- Chinese coins and MAGATAMA beads- found at a site in Okinawa. 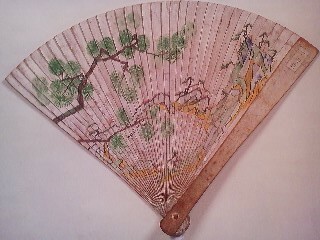 The objects illustrating how the Ryukyu Islands were a melting pot of Japanese, Chinese, Korean, and native cultures. Various artifacts from Okinawa- note the MAGATAMA beads and Chinese coins! Interestingly, offerings to Shinto Shrines do not necessarily have to be objects. They could be in the form of dance, song, the performance of a play, sumo wrestling, or the display of ones martial arts skills, among others. 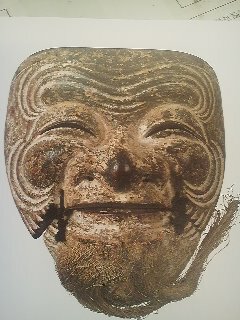 The Noh masks, and costumes on display are just a few objects which remind us of such heartfelt offerings. A third type of treasure would be those objects which were used during rituals or festivals and the records of such events- in pictures or writing. 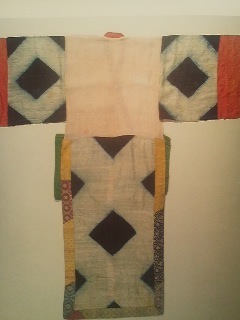 The curators have put two OMIKOSHI portable shrines on display, as well as various costumes (in surprising colors), and masks. 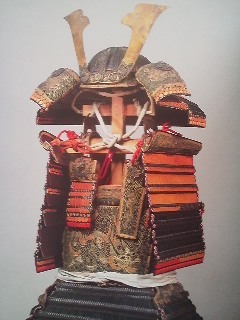 Looking like the beautifully decked-out palinquins which used to carry around Japan`s ruling classes these were made for transporting deities- usually for the occassion of MATSURI (festivals). There are also a couple of very detailed paintings on show at the exhibition which show what happened at some of Japan`s most famous festivals: the Gion Festival and the Hie Sanno Festival. Unfortunately these works are so detailed and finely rendered that I could not make out very much of what was depicted- bring your opera glasses! Finally, there are the types of objects which seem most clearly connected with Buddhism- carved images of Shinto deities and painted hanging scrolls depicting of shrines or deities which resemble either Buddhist Mandalas paintings or Buddhist statuary- though the Shinto carvings of deities are much more simple and rustic than their Buddhist counterparts: some look as if they were made by amateurs. 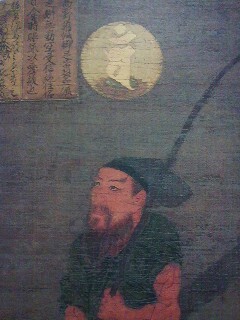 The paintings on the other hand, show very high technical skills and portray a wide range of subjects: portraits of deities, stories from mythology, chart-like representations of shrines, as well as votive paintings (which at first were exclusively of horses, but later to reflect the object which worshipers were praying for). In the early form of what is now called Shinto- there were not even any buildings- just some rope (shimenawa) and bamboo to mark off a sacred space: maybe at some unusually shaped boulder, or a gnarled old tree, a volcano, a mysterious pond- anywhere the ancient Japanese sensed the presence of the divine. Shrines without actual buildings can still be found today. The most famous one is the Omiwa Jinja Shrine in Nara Prefecture at which a mountain is the object of worship- before it stand torii gates and shimenawa ropes to delineate its sacredness. 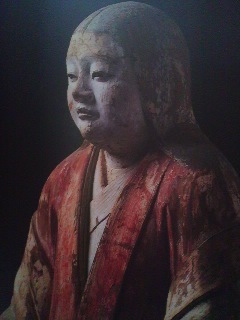 The idea of carving and painting images of Shinto deities is certainly a result of Buddhist influence. 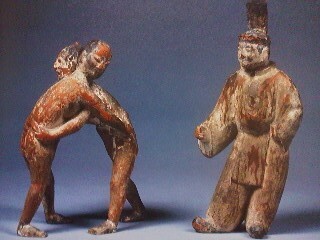 The oldest extant examples of such wood carvings date back to the 9th century. 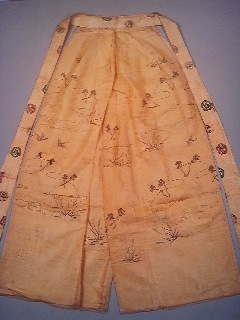 The images on display at the current exhibition portray their subjects (various Shinto divinities) dress in the garb of the aristocracy of the time- which must be an attempt to emphasize the link between the contemporary ruling class, and the reason they remained privelidged- their illustrious (and deified) ancestors. 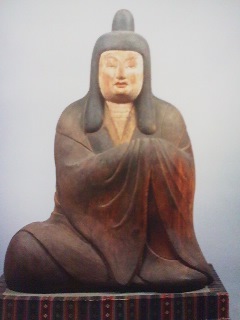 Still it is amazing for me how few images of Shinto deities there actually are. And if there are any you can almost never actually see them (an exception in this area is the carving of Taira no Masakado at the Kokuo Jinja Shrine in Bando-City) at a shrine. This could be because Shinto tended to stay away from giving form to its deities OR because many images were destroyed in the violence involving separating Buddhism from shinto (HAIBUTSU KISHAKU, during the 1870s). Much more skillfully executed than most of the statues on display are the hanging scrolls and other paintings depicting Shinto deities. And this was probably the only genre of Shinto art included in the current exhibition which I was very familiar with- since many families in Tsukuba`s old neighborhoods display such hanging scrolls (most commonly of the Sun Godess Amaterasu) in their alcoves (TOKO NO MA) during the New Year`s (O-Shogatsu ). season. There is an important difference, however. 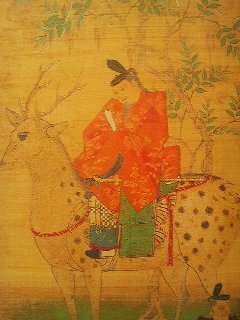 The hanging scrolls hung in the old neighborhoods of Tsukuba are purely Shinto, and remind us not at all of Buddhist painting. They are in fact a little cheesy. The works on display now in Ueno were all made well before the Meiji Restoration and the separation of Shinto and Buddhism. They were made during a time when these two now separate religions mingled nearly as one, having continued to evolve into a syncretic faith ever since the Heian Period. 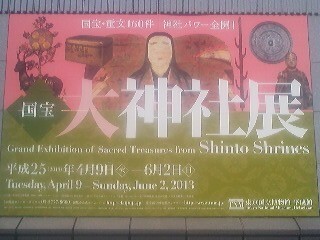 In other words, before 1868 Buddhism and Shintoism were usually not referred to separately and this is evident in the so-called Shinto paintings on display at the exhibition. 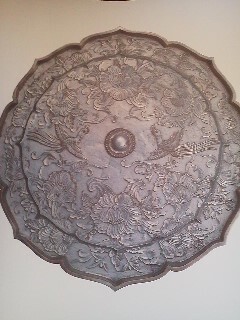 Many of them are replete with Buddhist symbolism (and Sanskrit letters) and messages. 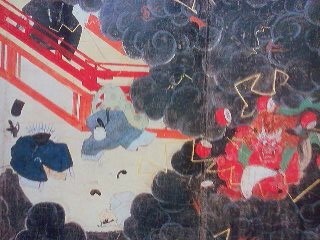 Paintings of the deity Hachiman in the form of a Buddhist monk, and other native gods(including the God of Kasuga, shown below) with Buddha images ror Sanskrit letters above them indicating their Buddhist natures. These works brought to mind the difficulty there is in trying to explain the difference between Shinto and Buddhism as they existed before the Meiji Restoration. And though it was not the purpose of this exhibition to focus on that question ( a question upon which I spend much time when trying to explain the difference between temples and shrines to foreigners who I am guiding around Japan) I still came away from this extravagant show feeling that it taught very little about what Shintoism was- but visitors were surely able to get a look at some magnificent objects which have been held for safe-keeping in the treasure-houses of Shrines throughout Japan. 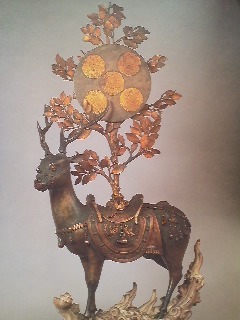 Deer bearing deities of the Kasuga Grand Shrine in their true form (14th century)- the circle in the tree contains images of Buddhas, which this sculpture suggest were the deities true form. 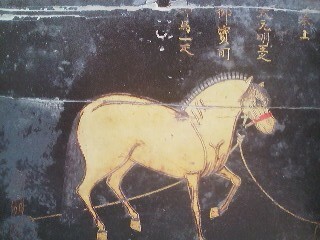 Votive plaque (1571) from Fukushima Prefecture Apparently, in ancient times worshipers actually offered live horses at certain shrines. I guess it was probably realized that this was the waste of a good horse and tablets with PAINTINGS of horses replaced the live animals.